Τhe project is an ambitious housing experiment in the centre of Patras. An existing building from the 1970’s -a former private clinic- is being refurbished and converted into a prototypical urban complex offering 52 student studios and various communal spaces. The scheme is a rational, systematic and integrated approach to housing in a conscious effort to achieve high densities nevertheless, not at the expense of quality or comfort. The building fitted with state-of-the-art materials and bioclimatic technologies, responds to the tenants’ demands for flexibility, security and energy saving. The particularities of the programme required the total demolition of all interior wall partitions on all 8 levels in order to re-establish a logic in the building’s spatial organization. The sizes of flats vary from 20m2 to 48m2 with the highest percentage at 35m2. - an interstitial layer in-between the ‘communal’ corridor and the ‘private’ living space, containing the wet and storage units. Emphasis has been equally paid to the design of the communal spaces. 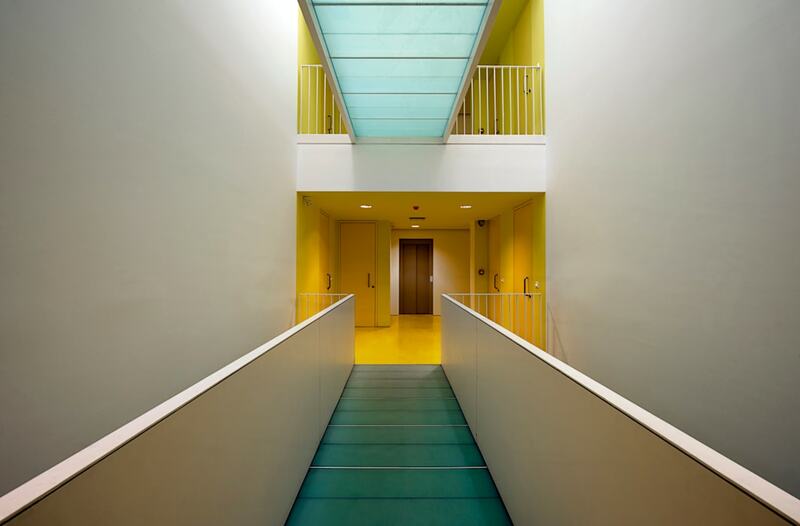 Beyond ground level, access to all flats is through a communal, skylight atrium. Once a light well, this generous, vertical space becomes the social core of the building, while at the same time ensuring the bioclimatic benefits of cross ventilated spaces. On -01 level, 52 storage ‘cages’ and a launderette, cater for the residents’ needs and further encourage their social interaction.